Relive favorite moments from the happiest, most sparkly and colorful TV series around with the LEGO® Unikitty™! 41452 Prince Puppycorn™ Trike. This fun set features 2 sparkle matter stud shooters, bone, flag, huge rolling basketball for a front wheel and baseball-decorated rear wheels! The set also features a crate of treats and 3 buildable figures from the series. Price is 31% below the initial Lego retail price, a € 4.70 discount! This comes down to 10.19 cent per brick. The Prince Puppycorn™ Trike (41452) Lego set is available from the sites below. However, they do not offer delivery to your selected region. The Prince Puppycorn™ Trike (41452) Lego set is no longer directly available from the sites below. However, 3rd party partners of these sites might still have the set available. Alternate description Whizz off in search of fun and adventures with Prince Puppycorn™ and his friends. Includes buildable Prince Puppycorn™, Dino Dude and Kick Flip figures. Features a tricycle with oversized basketball front wheel, baseball-decorated rear wheels, 2 sparkle matter stud shooters, plus a crate. Accessory elements include sparkle matter studs for shooting, a ball, ice cream and a pizza. Spread the spirit of fun and adventure with Prince Puppycorn™ on his amazing trike! Have fun playing ball with Dino Dude and Kick Flip before tucking into delicious pizza and ice cream! 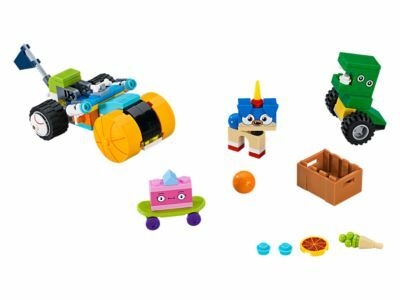 Combine with 41451 Unikitty™ Cloud Car to team up with Prince Puppycorn’s big sister and create even more adventures in Unikingdom. Trike measures over 2” (6cm) high, 3” (10cm) long and 2” (7cm) wide. Dino Dude™ measures over 1” (5cm) high, 1” (5cm) wide and 1” (4cm) deep.